​Chila: Your lyric essay, "The Goshawk," is both lyrical and beautiful, as are so many others we received during this reading period. Yours especially stands out to me because of phrases such as "its breast a neck of feathers strewn with light," and "we can hear rustlings of mortality, its scratching in the mind's attic." Lines both detailed and meditative, universal. Talk about your language formation process: how do you come up with lines like these - have you developed this ability over time or is it a grueling thing where you revise and revise and revise? Carole: I think I've developed this ability over time, because I have a long-standing habit of taking long walks, observing the environment, and spinning out "this-is-like-that" metaphors in nature. Because most of my writing is fiction, the language I use has to stem from a deep knowledge of a particular character, made concrete by specific visual images. Whatever the form of the writing, the process is one of free association. For example, in the case of the "attic" image, I saw my own mind as an attic, which holds the same physical place in a house that a head does in a body. Like the mind, it gets stuffed with all sorts of forgotten things...but in writing, my mind's eye watched that attic, knowing that something was about to happen. All of a sudden, I heard a rustling sound that could only be mice, and I knew that they'd find a way through the cracks in the floorboards and into the rest of the house. This, I knew, was the right metaphor for mortality. This associative process happens very quickly and may involve more than one sense, but the experience of writing this way is one of both intense awareness of the subject and free association with words. It is also immensely satisfying. Chila: How does study & research figure into your writing? Does a topic present itself and you write about it or do you research after a topic has been decided on? Carole: I think it depends on the form of the writing. In fiction, I often feel as if the topic chooses me, and so my characters may take me places — both physical and psychological — that are unknown to me. This means that I have to do research as I go along in order to keep up with my own fictional creations (which at this point in the process feel like real people). I love doing research because it always enriches the process of creation. For example, I may walk down a familiar street while observing it as my fictional character might, and it will become new and a source of wonderment. Research grounds the work in reality, and accurate details help make a convincing argument for whatever deeper truths the work may possess. In the case of "Goshawk," research was needed for an accurate description of the bird. Chila: Raptors are a special favorite of mine. I spend several hours a week working with rehabilitated birds, feeding them, helping train them "on the glove." Have you actually ever worked with goshawks? If not, do you want to? Or are you content reading about them, as many are? Carole: That must be very inspiring work! I've never worked with goshawks, and I have no plans to do this, but I'm fascinated by all raptors. A year ago, I took part in a "raptor experience" at a provincial wildlife centre north of Toronto. This involved an hour and a half spent "behind the scenes," including a walk with Rusty (a male red-tailed hawk) on my glove, along with instructions on handling the jesses, helping him remain balanced and feeding him a mouse or two. It was enthralling. Such a light and beautiful creature, both understandable in terms of visual acuity and evolution, and yet mysteriously "other" — a strange and beautiful work of nature. What else could you do but love him? As objects of awe and contemplation, raptors stir the depths. Chila: You have several books out. How often does lyricism enter into your writing? Do you feel any of your books are especially lyrical? Carole: All my fiction ends up being lyrical, if only because I can't seem to grasp the essence of a character unless I've conjured him or her up with a series of images. My novel An Ordinary Star adds the element of magical realism, and this is also true in my forthcoming novel All That Is Solid Melts Into Air. My two recent novellas (Here Comes The Dreamer and Midsummer) are shorter introductions to my work. Chila: As is nearly unanimously the case with our lyric essay contributors, your poetry has been published in various venues. Tie them together for me: the lyric essay and the poem. And as some have repeatedly told me "they just don't get the lyric essay," might we justifiably assume "they just don't get poetry" either? Your thoughts. Carole: For me, both poetry and the lyric essay are language-driven; both work by juxtaposing ideas and images that may not, at first sight, appear to belong together. Yet it's the underlying unity that thrills both the writer and the astute reader. That is how I would connect the lyric essay and the poem. The distinction between them may only be one of form and length — prose shading into poetry and vice-versa. What's problematic for our distractable minds is the meditative nature of both these forms. Even the shortest poem or essay asks us to ponder both the words and the silence between them. These forms give us permission to mull over a phrase (or brood upon it, as a bird upon her eggs! ), allowing it time to open up to us. There's no rush, yet many of us don't stop to breathe (as poets may intend at a line break). Often, we zip through these skinny volumes, reading only with our eyes. It's a fact that our culture doesn't encourage us to form the habit of contemplation (treating it as unproductive "down-time"), and because of this, it's no surprise that many readers — some of whom devour massive novels — don't "get" either of these two more subtle genres. Apart from this, I'm beginning to wonder if we've damaged the habit of metaphorical thinking by severing our connection with nature. It seems to me that this bond is the one thing that roots us in life itself, allowing us to think with imagination, to make unlikely connections — and to find a place in our reading for all sorts of poetic lyricism. Chila: What's next on the writing docket? Carole: I'm hard at work on another novel and I plan to write more lyric essays and poetry. When I wrote "Goshawk," I wasn't sure how to categorize it, but I love this form and I find it very encouraging to know that there's an audience for this kind of writing. 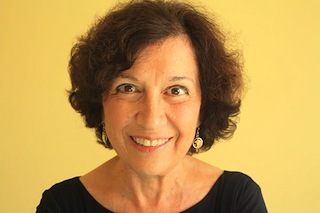 Carole Giangrande was born and raised in the New York City area, and now resides in Toronto, Canada. She is a former broadcast journalist with CBC Radio and the author of eight books, including two novels, a short story collection and three novellas, among them the award-winning A Gardener On The Moon. Her most recent work is the novella Here Comes the Dreamer (2015), and her novel All That is Solid Melts Into Air is due out in 2017. Her poetry has appeared in the journals Queens Quarterly and Grain.